Come on down to our first time ever absolutely FREE entrance Charity social! 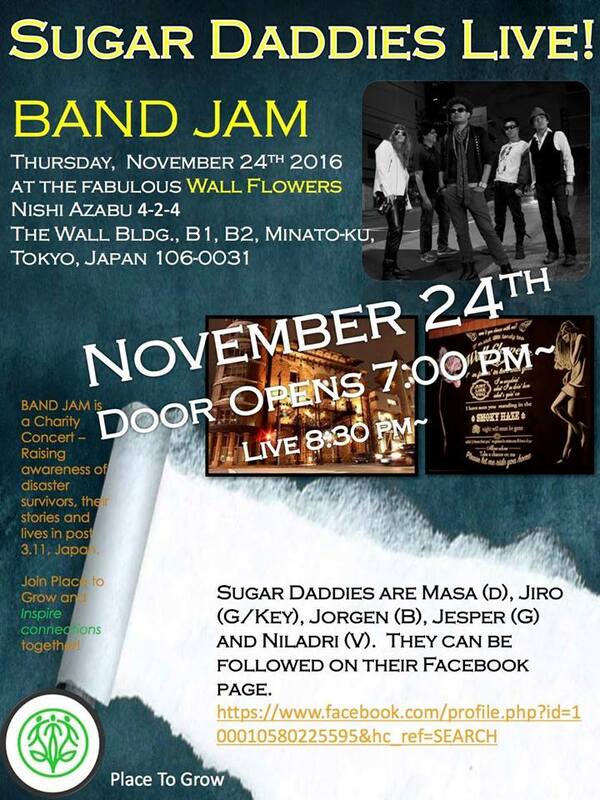 Playing in the swanky Wallflowers atmosphere is one of Tokyo's most dynamic bands... Sugar Daddies! ROCK is the vibe tonight, so dress up and get ready for a FUN night out. OGA volunteers will be there to share details about the Santa Soul Train 2016 and how YOU can get involved. Its about that time of year again for the OGA for Aid Pub quiz at the Hobgoblin in Roppongi. We have some awesome prizes this year and a HUGE announcement for you all! Its an exciting time for the organisation - A new program is ready to be shared with you and a brand new board of officers and advisors are here to explain how you too can get involved and also get your family, school or company engaged in the community. Teams are up to 4 persons. If you show up solo we will have our quiz coordinators pair you up with others to create a new team! Mosaic Art Workshop LET'S CREATE A COASTER & PHOTOFRAME WITH MOSAIC TILES! HELP WANTED A small group of international volunteers - up to 6 people - are needed at each Place to Grow workshop to provide an opportunity to interact in English, and assist with the activity. Please refer to Place to Grow website for further info. on upcoming Place to Grow Workshops and international volunteer opportunities. May Place To Grow workshop and the annual international get - together in Minamisanriku will be held on May 28th and 29th this year. The 29th morning, is a celebration of the new fish market in Minamisanriku cho - we will be organising a group visit to this event to socialise and encourage the local fishermen before we return home. 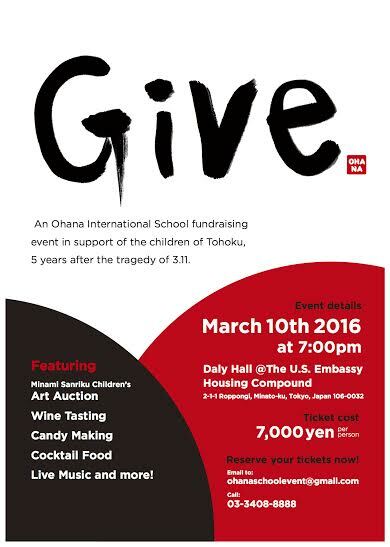 Ohana International School is holding an event to support the Place to Grow program on March 10th at the US embassy. There will be an art auction from the MSR kids, wine tasting, candy making, cocktail, food, music and more! Email " " to attend. O.G.A. 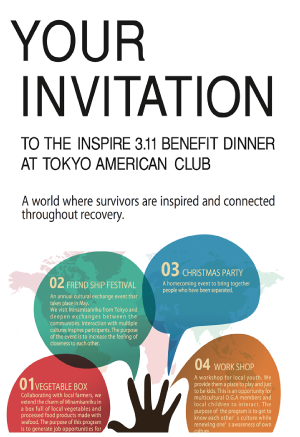 FOR AID Director and Founder Angela Ortiz requests the honor of your presence at the 5th year memorial benefit dinner of the 2011, 3.11 Tohoku disaster. Ongoing volunteering in post-crisis situations help survivors know that they are not forgotten. Payment: You can pay by credit card, at convenience stores (via Peatix) or bank transfer. For payments made via our Peatix page, Peatix's Processing Fee is added to the entrance fee, and the total per-person charge is 21,134 Yen. If you wish to pay via bank transfer, please deposit your payment along with the bank transfer fee charged by your bank to O.G.A's bank account. Enjoy the voice of multi-faceted singer and performer Charlie Okamura and voice-artist, entertainer and live DJ, Stuart O. Emceed by TV celebrity Hayami Yu and Quinn Emanuel litigation attorney, Ryan Goldstein. A special live performance from Tohoku! O.G.A. 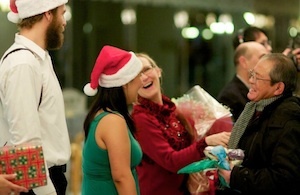 for Aid's 5th Annual Christmas Party is officially less than a month away! ***IMPORTANT NOTE: Volunteers' Packaged Plan does NOT include transportation between Tokyo and Sendai. You will need to arrange your own transportation to/from Sendai to your starting location. (Night Bus, Shinkansen, Train, etc.) You will be meeting with the full package plan group at Sendai Station on the 12th morning and travel to MSR together from there. On the 13th, Volunteer Package will be dismissed at Sendai Station. 11 / Nov. / 2015 Inspired Volunteers! The American philosopher Jim Rohn once said "It's not the million dollars that's most important, but who you become in pursuit of it." I found volunteering to be a similar experience and I have a story to tell you this evening at the concert. (Our first volunteer social CONCERT!!) If you are curious, or already know this to be true for yourself then rsvp by the 8th of November, please. Space is limited. This June, we raise money for project Place To Grow-- children are growing up as the cities rebuild in the devastated north. Its a rough and uncomfortable life right now. With NO personal space, 86,000 families are displaced and living in temporary shelters. Place To Grow is to be created to provide mental and physical healing opportunities for the children. If you want more details, arrive early! NPO representative Angela Ortiz and other OGA for Aid Officers will be there on the quiz night to answer your questions. 23 / May / 2015 International Tomodachi Festa! If you are in town, please come by and check out the first International Friendship Festival in Minamisanriku cho. Everyone will be gathering to see the Knights in While Lycra as they arrive after their 500km cycle ride from Tokyo. Drinks.....Starter beer and soft drinks available, but Bring Your Own Beer and add to the pool! After the rainy and cold hanami comes the sunny and warm spring picnic! Join the O.G.A. for Aid Spring Picnic social event! 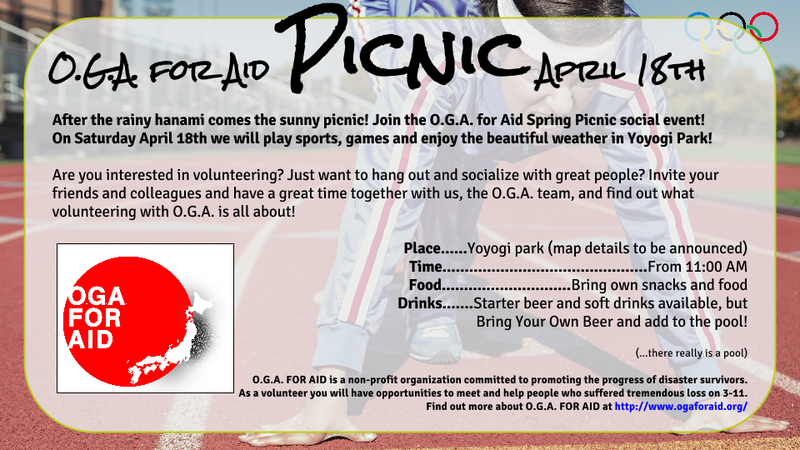 On Saturday April 18th we will play sports, games and enjoy the beautiful weather in Yoyogi Park! Are you interested in volunteering? Just want to hang out and socialize with great people? Invite your friends and colleagues and have a great time together with us, the O.G.A. team, and find out what volunteering with O.G.A. is all about! 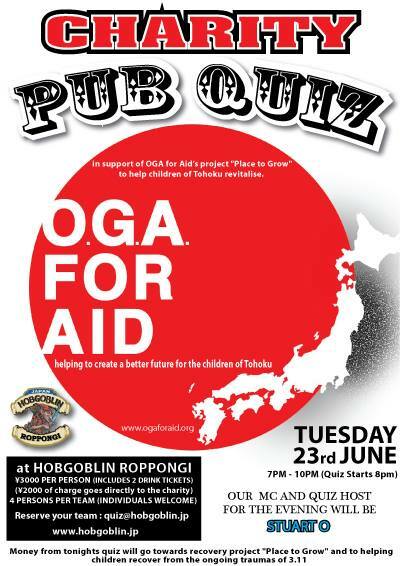 Join the charity quiz night 31st of March in Hobgoblin Roppongi, Tokyo! Sign up with your friends for a good nights fun - supporting OGA for Aid while you're at it. What could be better? ?If you would like to enter a team of 4 people (but singles are also welcome!) please email to quiz＠hobgoblin.jp to register. Raffle tickets with some great prizes will also be on sale! See below for details - and see you there!